Shigeyuki Kihara, Galu Afi: Waves of Fire (2012). Paramount Award of the 21st Annual Wallace Art Awards. Courtesy of Shigeyuki Kihara Studio, Milford Galleries Dunedin and the James Wallace Arts Trust, Auckland. Since 2002, Shigeyuki Kihara has imagined the solemn dances and wanderings of ‘Salome’, a fictitious characthttp://danceer based on an unknown woman clad in Victorian mourning, staring confidently from Thomas Andrew’s photograph Samoan Half Caste (1886, Te Papa). Dance of the Seven Veils, a title inspired by a play written by Oscar Wilde, brings Salome to Corban Estate Arts Centre for the first time. 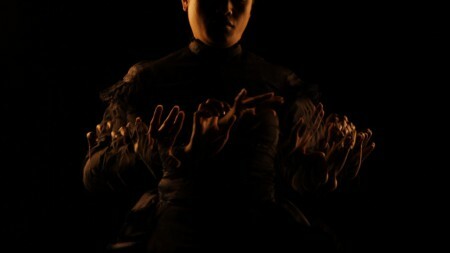 Three video works explore Kihara’s engagement with the ancient Samoan dance form taualuga, a complex ballet. Whereas Taualuga: the Last Dance (2006) is an elegant exploration of the power of the last dance, Siva in Motion (2012) and Galu Afi: Waves of Fire (2012), are like the Salome of biblical and Victorian portrayal, devastating in their power as they echo the destructive waves of the 2009 tsunami in Samoa, American Samoa and northern Tonga, responsible for the deaths of nearly 200 people. Salome lifts the veil from portrayals of her country through the lenses of colonial powers and tourist photographs, to reveal the effects of global warming when the iconic signifiers of ‘Paradise’ are destroyed. Five photographs from Kihara’s series Where do we come from? What are we? Where are we going? (2013) see Salome resisting the colonial gaze, pointing her own towards Samoa. The title, from Paul Gauguin’s painting (1897), frames Kihara’s examination of Samoan culture and society following the tsunami of 2009, the 50th anniversary of Samoa’s independence, and most recently the destruction caused by Cyclone Evan in December 2012. A native of Samoa, Shigeyuki Kihara is an interdisciplinary artist whose work engages in a variety of social, political and cultural issues. Often referencing Pacific history, her work explores the varying relationships between gender, race, culture and politics. Kihara’s work has been presented at the Asia Pacific Triennial of Contemporary Art, Auckland Triennial, Sakahàn Quinquennial and the upcoming Daegu Biennale in Korea. The Dance of the Seven Veils forum explores the ideas behind the exhibition and addresses Kihara’s key themes, representation, historical revisionism and the narrative in contemporary art. Shigeyuki Kihara will be in discussion with Dr Billie Lythberg and art historian Samantha McKegg. Billie will locate Shigeyuki’s exhibition on the site of the Corbans’ homestead, discussing the history of their association with West Auckland with a focus on the repurposing of land for vineyards and the reconstitution of home away from home. Looking further back, the Corban Estate Arts Centre is situated on the traditional lands of Te Kawerau a Maki. This legacy will be held in conversation with both Corbans’ history and Kihara’s exhibition. Corban Estate Arts Centre would like to acknowledge the support of the Corban Family, Hocken Collection of the University of Otago, Te Papa Tongarewa Museum of New Zealand, Gus Fisher Gallery of the University of Auckland and Milford Galleries Dunedin.